Enterprise Class Group and project management features are now available with a single click to the Dashboard. Mockuptiger allows you to create any number of groups. 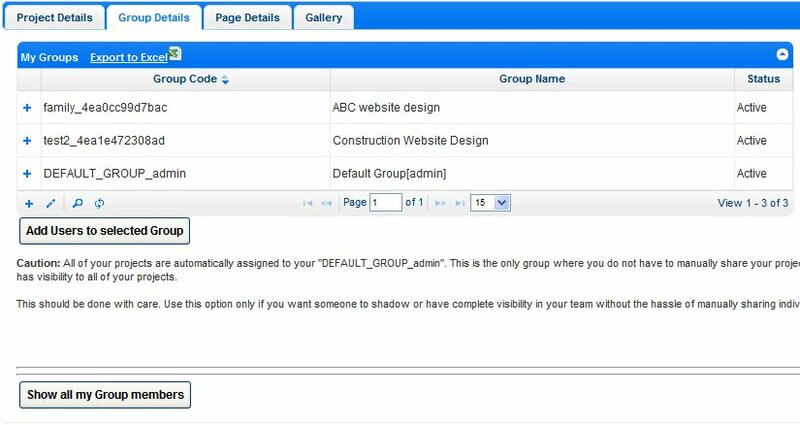 Each member of your team can create their own groups. Groups is like the “Circles” feature in Google plus.
. It is a simple and very powerful concept. This power is available when you use Mockuptiger to build your wireframes and prototypes. Groups is a very powerful and simple concept. If you are a web agency then every client and members working for them is part of a small group. ?ClientA group? and ?ClientB group?. If you are a big organization then each small team can be a group ?Web design group?, ?Software Development Group? and so on. A group is like an umbrella, you can add users to the group and users can share their projects to the group. So now every member of the group can see all the projects in the group. Project access is tightly controlled through the dashboard. You can now share your documents to public by simply providing the link. See, how easy it is! But wait, sharing the URL does not mean you lose control over it. You need to make the document public through the dashboard. And yes, once public you can always revoke the public access.